Vinyl revival: Tesco ups vinyl stock as first new presses in 30 years unveiled | What Hi-Fi? The vinyl resurgence continues apace, as Tesco announces it will begin selling more vinyl records in its stores and new pressing plants are opening in America. Following a presumably successful trial selling Iron Maiden’s latest album, The Book of Souls, on vinyl, Tesco is adding more vinyl to more stores - as well as turntables. 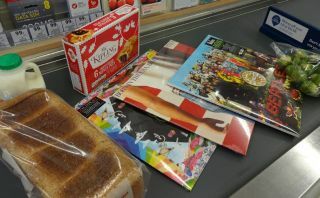 Some 20 new vinyl albums will be available in 40 Tesco stores around the country. The albums will cost between £12 and £20 and include Coldplay’s new album A Head Full Of Dreams, ELO Alone in the Universe, David Gilmour Rattle That Lock and The Beatles Sgt Pepper’s Lonely Hearts Club Band. The supermarket chain is also selling a small range of record players, including the Award-winning Pro-Ject Essential II. Tesco music buyer, Michael Mulligan, said: “Our trial selling vinyl this summer was a real success with all our stock selling out and this really proved to us just how popular the vinyl album format is again with music fans. It’s also been reported this week that first new vinyl presses in 30 years have been produced and subsequently installed at Third Man Records - the record label owned by Jack White of The White Stripes and The Dead Weather. The 10,000-square-foot production plant should begin pressing new vinyl records in spring 2016 and will have a viewing window for visitors to see how a record is made. The presses are being made by German company Newbilt Machinery, which has used the design of current record presses but fitted more modern features such as an electronic control system and a hydraulic power supply. The presses will work alongside business partner, Record Products of America (RPA) in Connecticut, who make the molds. RPA technical sales manager, Dan Hemperly, says there are only 21 vinyl record manufacturers in the US, many of which are using machinery up to 50 years old. With high demand from many big-name artists such as The Arctic Monkeys and Adele, there’s an equally high demand for more presses to reduce the time it takes to get products to market - something this new press aims to help solve.